Cook the spaghetti according to pkg directions; drain (should have about 3 C spaghetti). Stir butter or marg. into hot spaghetti. Stir in parmesan cheese and eggs. Form spaghetti mixture into a "crust" in a buttered 10" pie plate. 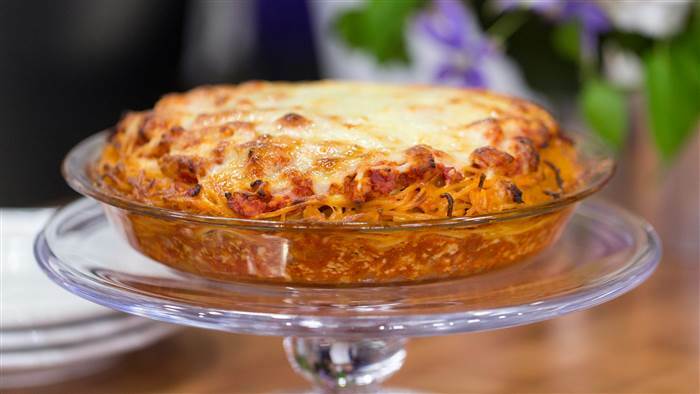 Spread cottage cheese over bottom of spaghetti crust. In skillet cook gr beef or pork sausage, onion and gr pepper till veggies are tender and meat is browned. Drain off excess fat. Stir in undrained tomatoes, tomato paste, sugar, oregano, and garlic salt; heat through. Turn meat mixture into spaghetti crust. Bake, uncovered, in 350° oven for 20 min. Sprinkle the mozzarella cheese atop. Bake 5 min longer or till cheese melts. Makes 6 servings.